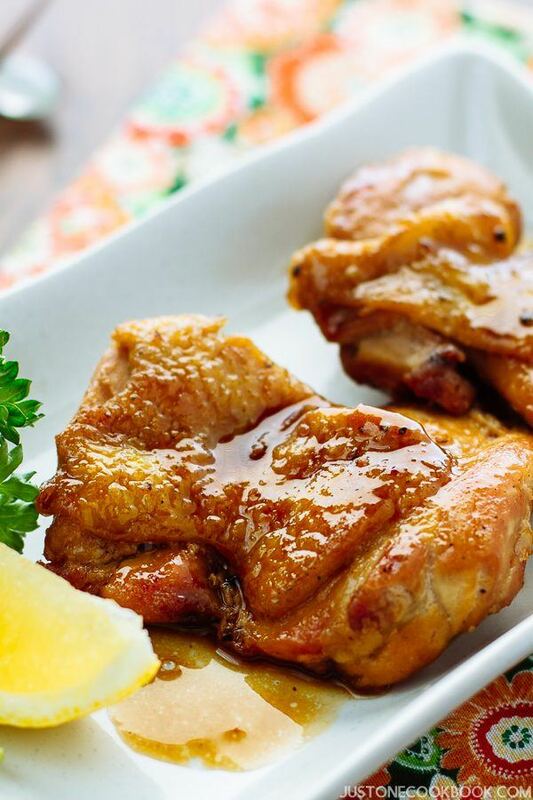 Glazed with delicious soy-butter sauce, this easiest and tastiest Butter Shoyu Chicken recipe will win your family’s heart! Once in a while I get stuck in the rut with menu planning and I don’t know what to cook. As my children love chicken, my easy solution often comes to this Butter Shoyu Chicken (バター醤油チキン). 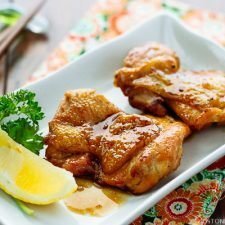 The flavor is similar to Teriyaki Sauce, but everything is homemade, and with the addition of butter the sauce is creamier and even a bit sweeter. If you have never combined these two ingredients together, you will be pleasantly surprised how delicious these two flavors bring to a dish. In Japan, you will see many dishes flavored with butter and soy sauce flavor (butter shoyu aji, 醤油バター味 – Shoyu means soy sauce in Japanese). Japanese style pastas are often seasoned with soy sauce and butter and a popular street snack, grilled corn flavored with soy butter (バター醤油コーン), is absolutely addicting too. 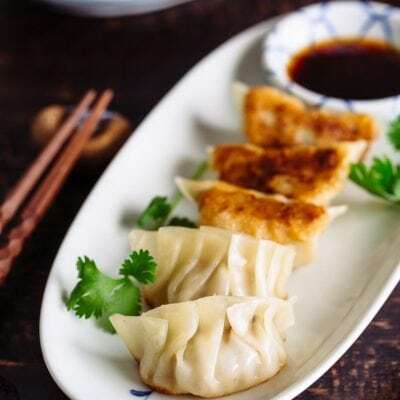 Butter adds a rich wonderful creaminess and sweetness to the salty savory soy sauce, making the combination a great sauce and glaze over meats, vegetables or even noodle dishes. Instead of using chicken breasts, I prefer to use chicken thighs. Fattier than lean meat, they are less likely to turn dry on the heat. 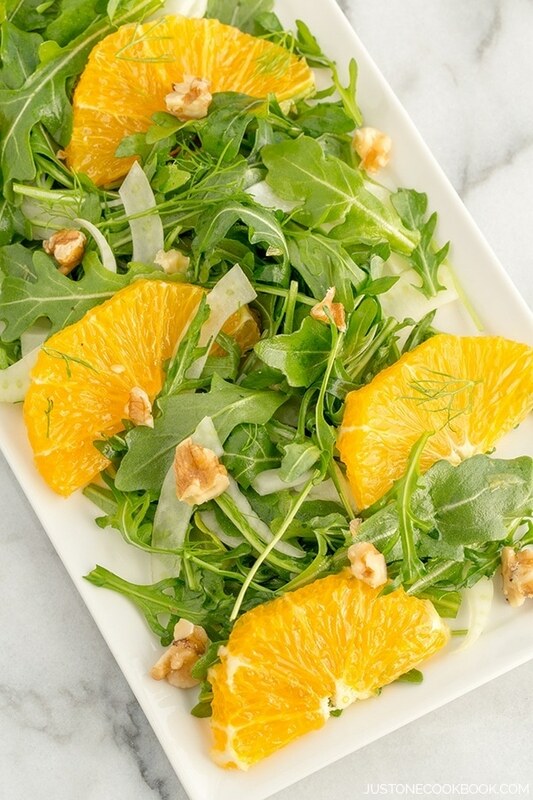 These inexpensive cut is best for a recipe like this. 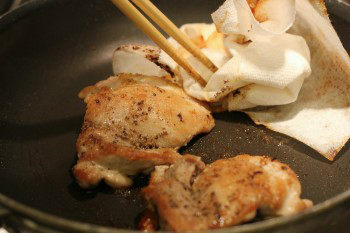 You get tender juicy chicken meat and crispy skin that is seared on the hot pan, which means perfection. The ingredients for the butter shoyu sauce is short, but it’s packed with flavor. You want to spoon any remaining sauce in the pan over the chicken before serving. If you are thinking of cooking chicken tonight, definitely give this recipe a try. There is no need to marinate the chicken, and you can finish cooking in 30 minutes! 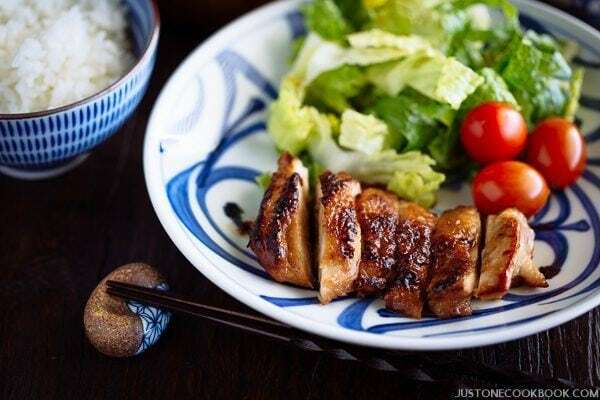 Serve the Butter Shoyu Chicken with steamed rice alongside a vegetable dish and you’ve got a delicious meal for the family. 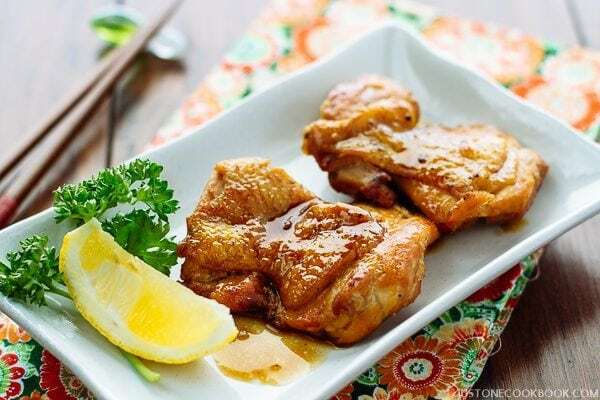 Glazed with delicious soy-butter sauce, this easiest and tastiest Butter Shoyu Chicken recipe will win your family's heart! 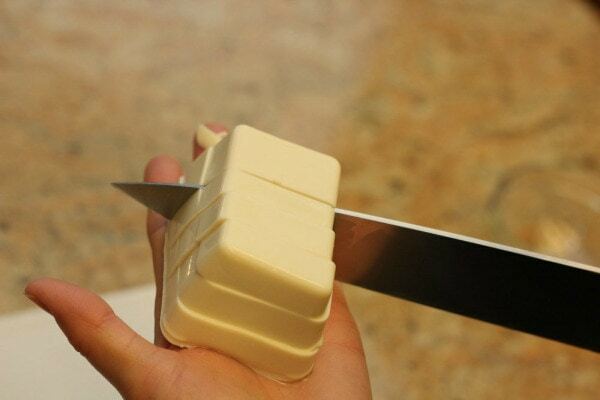 Gather all the ingredients. Lightly sprinkle kosher salt and freshly ground black pepper on both sides of the chicken. In a large frying pan, heat oil on medium high heat. If the chicken has skin, cook from the skin side first. When the bottom side is nicely browned, flip over and reduce heat to medium heat. Add sake and cook covered until liquid is almost gone. Remove the cover and cook until the chicken is almost cooked. 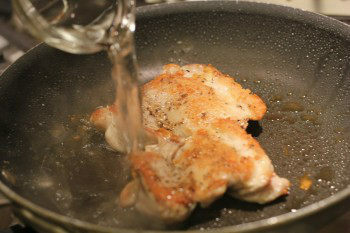 Then wipe off excess oil on the frying pan with paper towel. 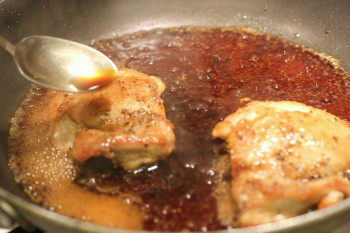 Add the sauce and coat the chicken well with sauce using a spoon. When the sauce gets thicken and small bubbles appear in the pan, add the butter. 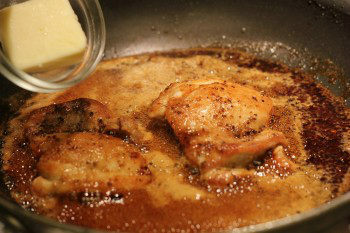 Spoon the sauce over the chicken When the butter is melted, serve the chicken onto a plate. Pour some sauce over the chicken. Editor’s Note: Picture is updated in March 2012. You certainly don’t need St Valentine’s to cook this one. Your dish looks divine. Interesting about making your own teriyaki rather than the bought stuff. 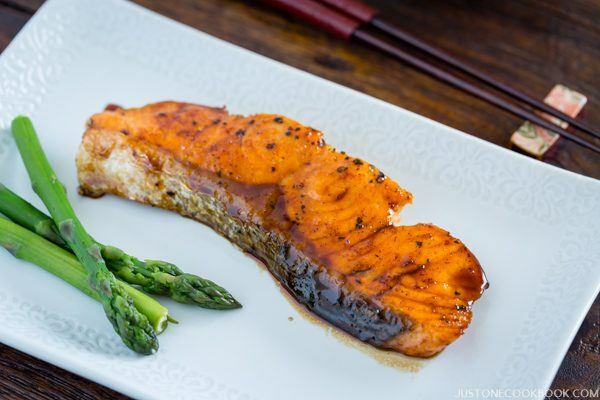 I’ve recently good hooked on making a mirin sauce with salmon and it’s so easy. I must try your dish here with the chicken. Look like it will be a hit in our house! 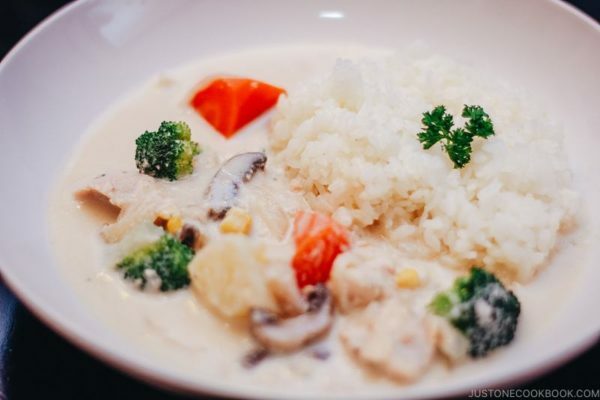 So glad to find your blog and learn about Japanese cuisine. 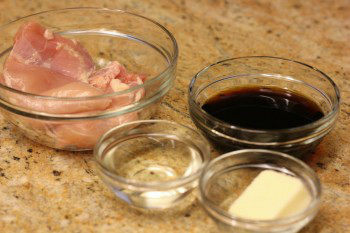 Mirin is one of the 3 important condiments for cooking Japanese food (along with soy sauce and sake). 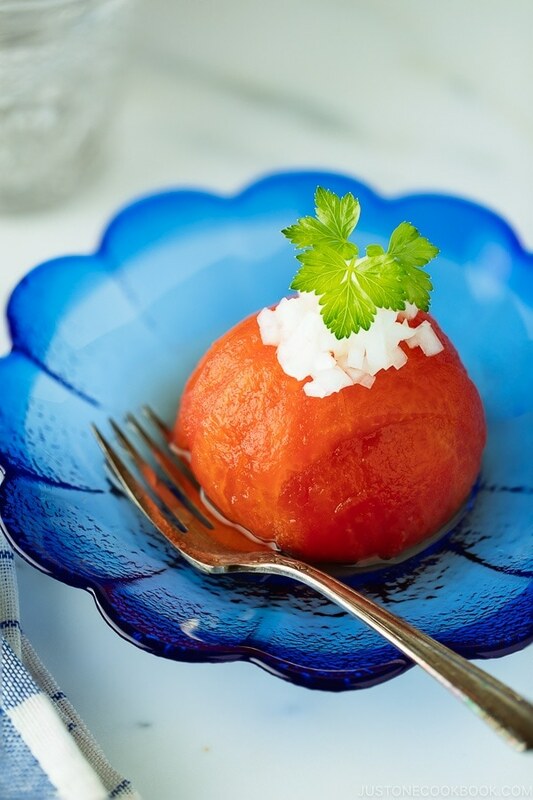 Therefore you will find lots of recipes in my website using mirin. Hope you enjoy the teriyaki chicken! 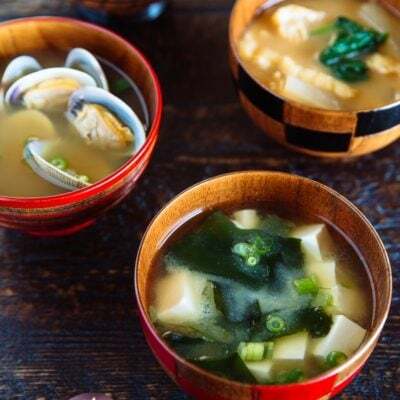 I am living in Okinawa and trying to cook Asian, so your site is very helpful. I would prefer using chicken breast instead of thighs. What do you think? Hi Lexi! I’m happy to hear you like my blog. 🙂 Chicken breast works too, but it is more dry so we don’t usually eat that much. 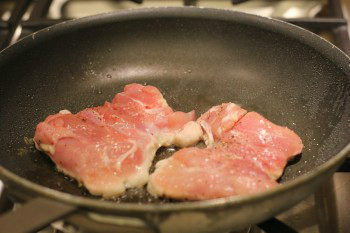 I think cooking in a frying pan is quicker than oven, and it keeps moist in the meat. Hope it will work! Oohh!! I am totally going to try your teriyaki sauce recipe! I’ve been trying to find a good teriyaki recipe and they always ended up too salty or what not. Bookmarked! Is cooking sake the same as “kikkoman Manjo Aji-morin sweet cooking rice seasoning”? Just stumbled onto your site and want to make everything on here!! My bottle of mirin says it’s a cooking sake, but they are not the same thing, are they? I’m glad you found my blog, welcome! Mirin and cooking sake is different. I’ve noticed that some level says cooking sake. 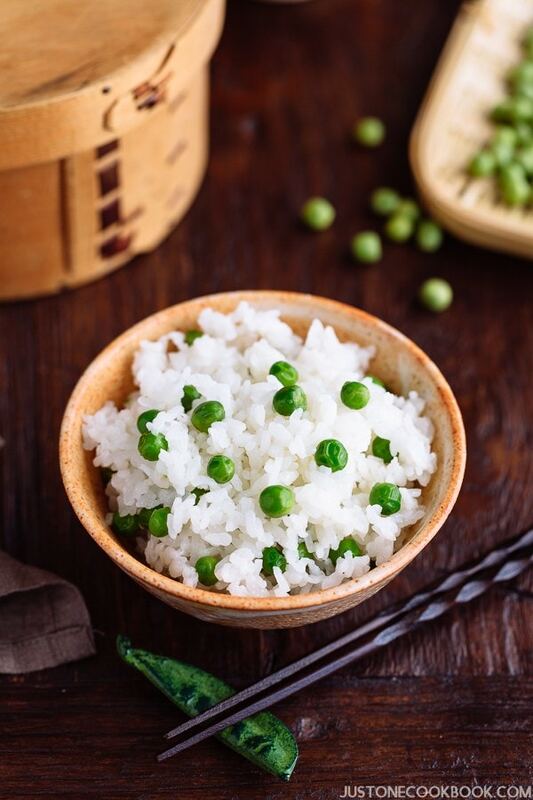 You can use regular sake or cooking sake, or chinese rice wine. Mirin is sweet, and we use it to substitute sugar or gives some nice luster in the sauce, but it contains some alcohol in it. I made this today for dinner,I must say it was amazing and very delicious! I will be making this again! Hi Lena! Ohhh I’m glad you liked it! It’s easy to prepare right? Thanks for letting me know! I’m making this version of teriyaki for dinner. It sounds perfect. I cannot think what to cook tonight and have rice started but nothing else. Thank you for the idea! Hi Nami. I,m very pleased to find your blog. I visited Japan many years ago and of course I was eating in restaurants. 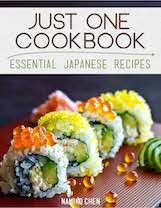 However, I always wanted to know more about japanese cuisine. I only have one question to you. you said you do not often eat Teryaki at home. Why ? and I’m interested in Tempura. 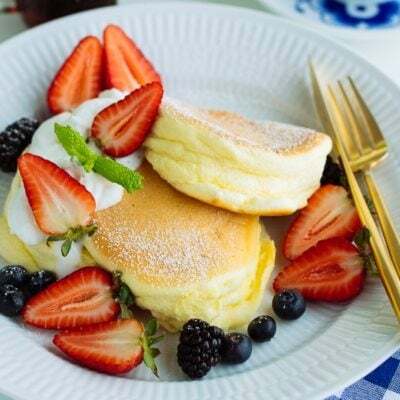 I will follow you and happy to try your suggested japanese recipes . Hi Mona! Welcome to my blog and I’m glad you stopped by! We have many other ways to make seasoning besides Teriyaki style sauce. 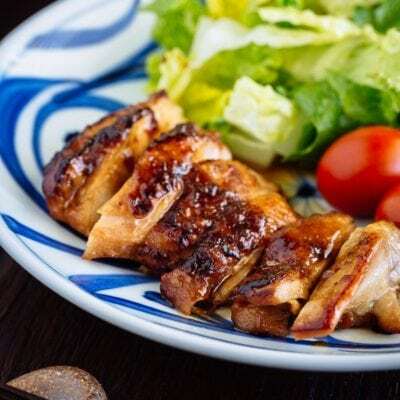 Unfortunately, most of Japanese dishes in Japanese restaurants have “Teriyaki” sauce only. But we have different kinds of sauce or marinade we use. So that’s why we don’t eat “teriyaki” often. 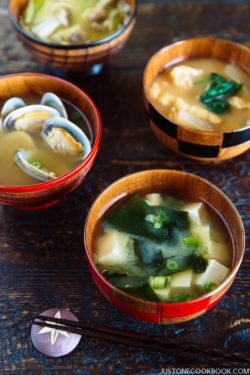 Many of Japanese dishes uses same condiments – soy sauce, mirin, sake, but we simmer or braise food and it’s no longer Teri “yaki” (grilled). I have a shrimp tempura recipe here and plan to share vegetable tempura soon. Hope you enjoy my recipes! making a crockpot teriyaki chicken and using your teriyaki recipe!! Thanks alot! Hi Vicki! Nice… I want a crockpot one day too! 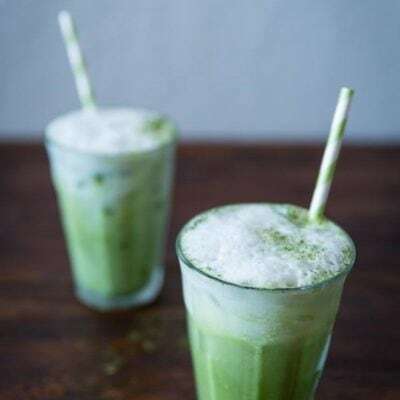 🙂 Hope you enjoy this recipe! i just did this teriyaki chicken for dinner. Looks good and am sure it’s yummy. I wonder for the extra sauce, can we keep in the fridge for the next dish like salmon? I’ve always love chicken teriyaki, and today I cooked it myself for the very first time! ^^ The taste is really really good (yay! ^^)… but the chicken did’t feel as tender as how it would usually feel when I get it from the restaurant. Do you have any idea what I did wrong? I was thinking maybe I cooked too long, I’m not sure..
Is it okay to cook with sake if i will serve this for my toddler? Thanks so much for replying! Now i can use both sake and mirin without any worries. My family loves japanese food most especially my 8year old. 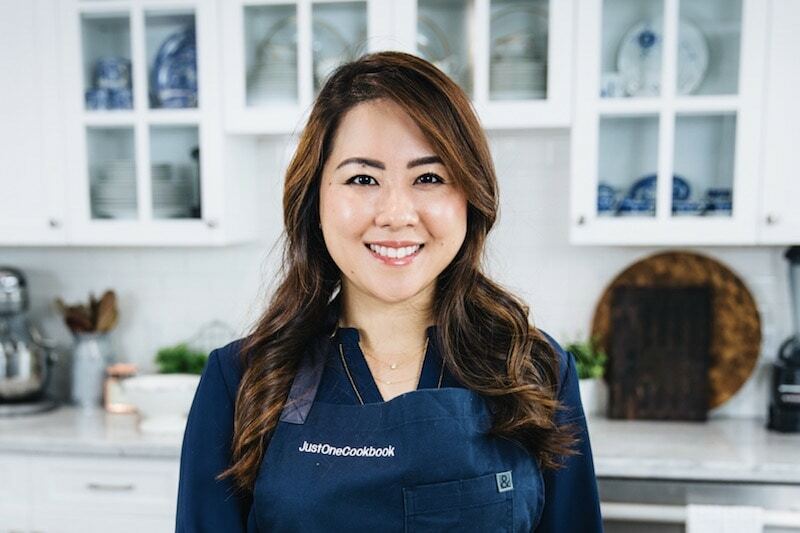 Love all your recipes esp the tonaktsu and tonkatsu sauce!!! 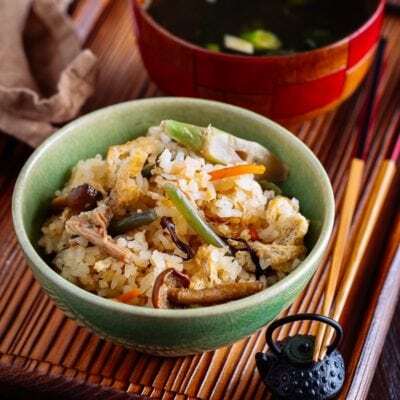 I recently discovered your blog, and being a working mum, your many quick, simple and delicious recipes such as gyudon and teriyaki are a life saver! However, I am just wondering if you ever encountered the issue of excess juice/liquid coming out of the chicken when you’re frying/stir frying it. My chicken produces so much liquid every time I had to cook uncovered for a long time for it to evaporate, and by that time the chicken would be too tough and dry! 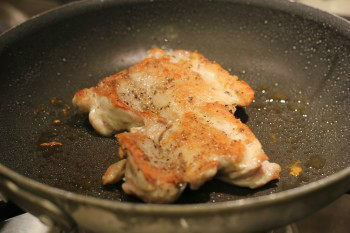 I tried coating the chicken with flour and that helps – but it’s certainly not the way you cook it! Hi Tracy! Thank you for finding my blog and I’m happy to hear you enjoy cooking from it. Tried this recipe for a quick dinner today, it was really good and we have no leftover ??? 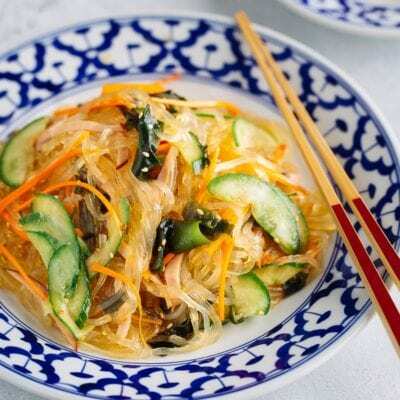 ?it is also very quick to prepare, great for a weeknight meal. Thank you! Any suggestion on a side vegetable dish for this dish? Hi Cynthia! So many options…but I don’t know what you like. 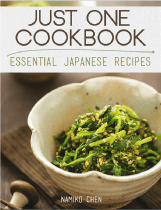 If I was cooking this tonight, then I’d pick Japanese Potato Salad (https://www.justonecookbook.com/japanese-potato-salad/) and Hijiki (https://www.justonecookbook.com/hijiki-salad/) or Spinach Gomaae (https://www.justonecookbook.com/spinach-with-sesame-sauce/). Hi Fonchie! Aww thank you so much for your kind feedback. I’m so happy you enjoy my videos and website. 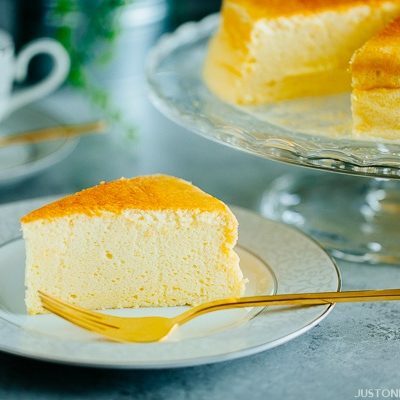 I hope you continue to enjoy my recipes! Thank you!! Hi there, this looks great. Can I ask what frying pan you use? Nonstick or not and name? I’m tired of my poor quality pans. Thanks! I just wanted to say thanks for this excellent recipe. I made it for my family tonight and we all loved it! Absolutely delicious! Just wanted to clarify, the “print” version of the recipe calls for adding the saké and covering until the liquid is almost gone. The instructions above do not. Which is right? Hi Sara! I’m glad you enjoyed this recipe. Thank you for your kind feedback! “Print” version and the recipe box are exact same recipe. Step 4, to be exact. What do you mean by “the instruction above”? Just made this tonight. So good! Yet so easy! Thank you!! I make lots of your dishes and I just love them. I have made the shoyu butter chicken a couple of times now, but I seem to struggle to get the 3 Tbsp of sake to fry off with a lid on. Do you have any advice?